Dr. Christopher's Herbal Parasite Syrup. These herbs act synergistically to aid in the elimination of worms and parasites. It is most effective when incorporated with fasting and a cleansing diet. This syrup is in a base of 100% pure vegetable glycerine. Dr. Christopher's Herbal Parasite Syrup, 4 oz. 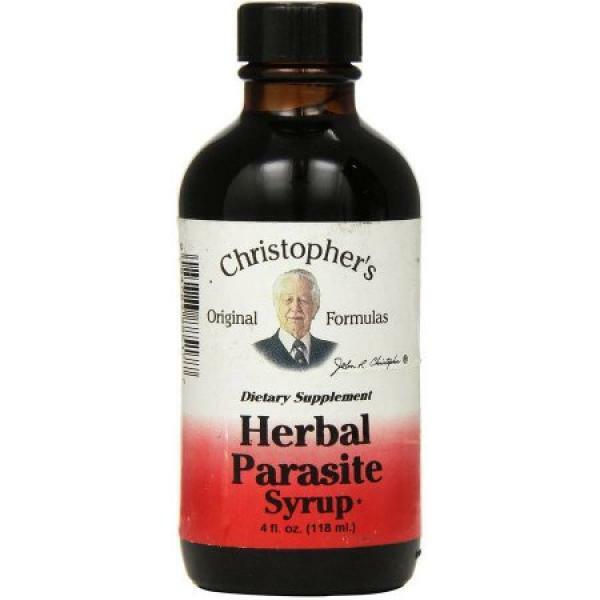 Product Description: Dr. Christopher's Herbal Parasite Syrup 4oz from Dr. Christopher’s Original Formulas This is a blend of Black Walnut Leaf, Fennel Seed, Senna Leaf, Tansey Herb, Tame Sage Leaf, Wormwood Herb, Malefern and Wild Sage Leaf. These herbs act synergistically to aid in the elimination of worms and parasites. It is most effective when incorporated with fasting and a cleansing diet. This syrup is in a base of 100% pure vegetable glycerine. Cleanse Herbal Parasite Syrup 4oz from Dr. Christopher’s Original Formulas. Directions: Shake well before opening. Take 1 teaspoon each morning & night for three days. On the fourth day take 2 Quick Colon Capsules. Rest two days & repeat this program 2 more times or as directed by your Health Care Professional. For optimum results take 1 hour before or after meals as to not compete with digestion.